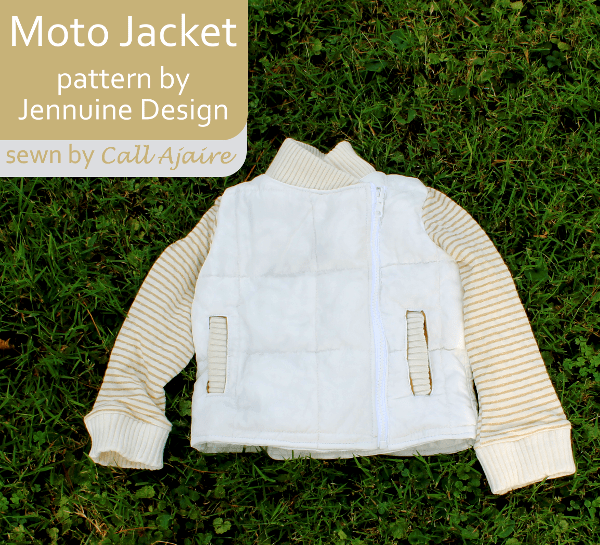 It’s day 4 of Jennuine Design’s Moto Jacket Tour and I’ve been dying to show you the fun jacket I made for Bean! I’m an affiliate of Jennuine Design which means that if you click on some of the links in this post and make a purchase then Call Ajaire will get a small percentage of the sale, but of course all opinions are mine – I love this pattern!. I’ve been working on getting rid of a lot of the excess clothing I don’t wear anymore (keep an eye out for some posts coming up for what I’ll be replacing it with!) and I stumbled upon a jacket in the closet from years ago. I’ve been looking for a picture of me wearing it and if I find one I’ll put it up on Instagram, hehe. 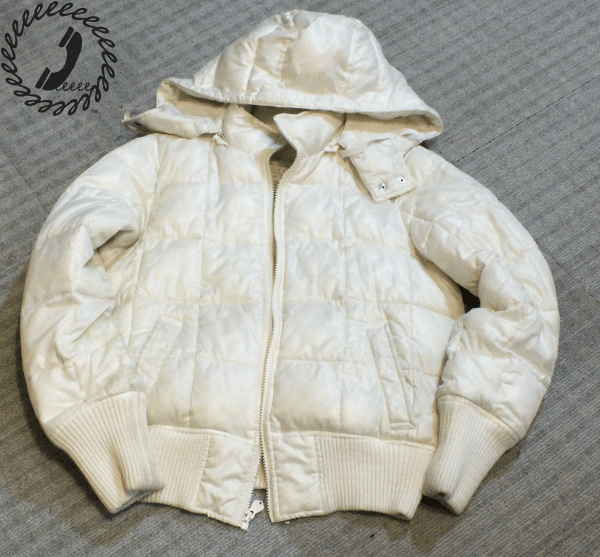 It was white and puffy and of course after years of wear it was starting to get dingy in some areas and it was time to toss it. I love the puffy feel of it so I decided to try to salvage what I could from it and make Bean’s Moto Jacket out of the pieces. I was able to get all of the pieces I needed from the outer jacket which was exciting. I knew I wanted to use a gold striped double knit from my stash for the sleeves so all that remained was to figure out what I wanted for a lining. I decided to go with a piece of suede that I had which was shiny and a goldish color on the reverse side. The slippery feel of the fabric works perfectly for a lining. Now let’s chat about this pattern! 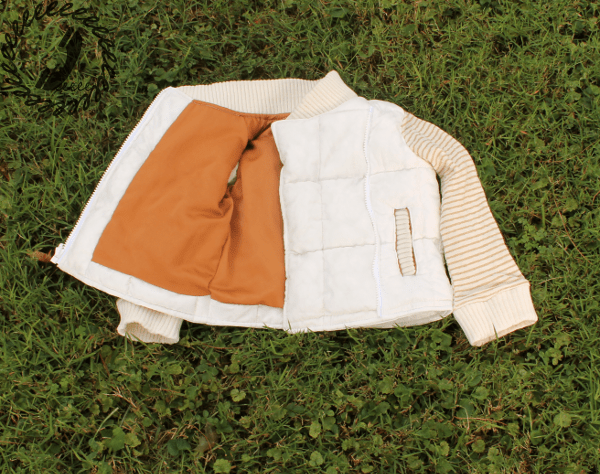 If you’ve never made a jacket before, this one is a perfect starter pattern. The Moto Jacket has a bunch of cool style elements, but none are difficult and she does an amazing job of walking you through each step. 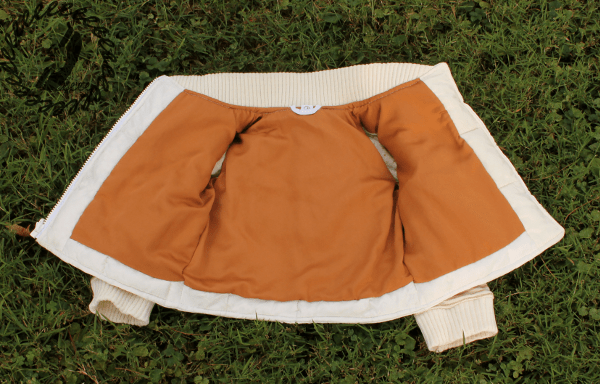 There are plenty of tips for working with leather or other “tricky” fabrics so you’ll have no trouble stitching it up. White is not the easiest color to photograph, but let me tell you just how HOT it was out when I took these pics. Even with bare legs, Bean was a trouper. It was so hot and humid that my camera fogged up when we walked out the door. So these pics are a little fuzzy, but I promise you the jacket turned out great! 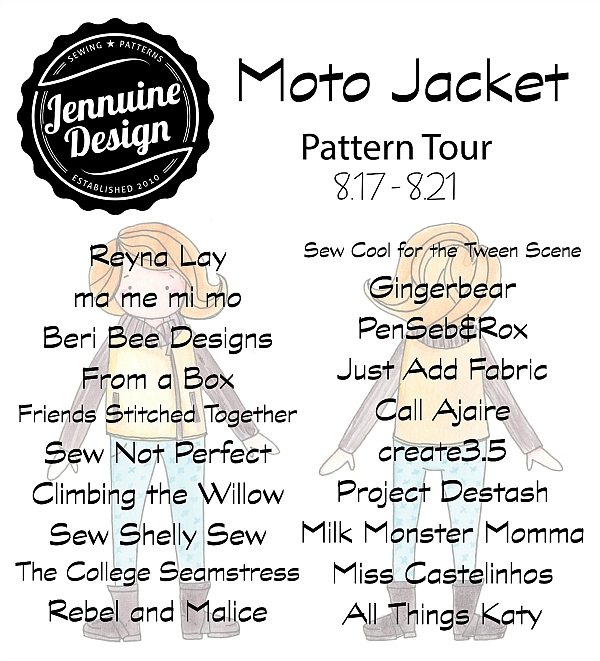 During the Moto Jacket pattern tour you can use the coupon code “MotoTour” to get 25% off the price. With sizes 2t through 12 there’s a lot of value in this great pattern. I’m sure you’ll see lots more of this jacket on Bean once the weather turns colder here. This will be a perfect transition piece and I can’t wait! I am so ready for some cooler weather. Fall is my favorite and a jacket like this one will be more than welcome once the chill sets in. 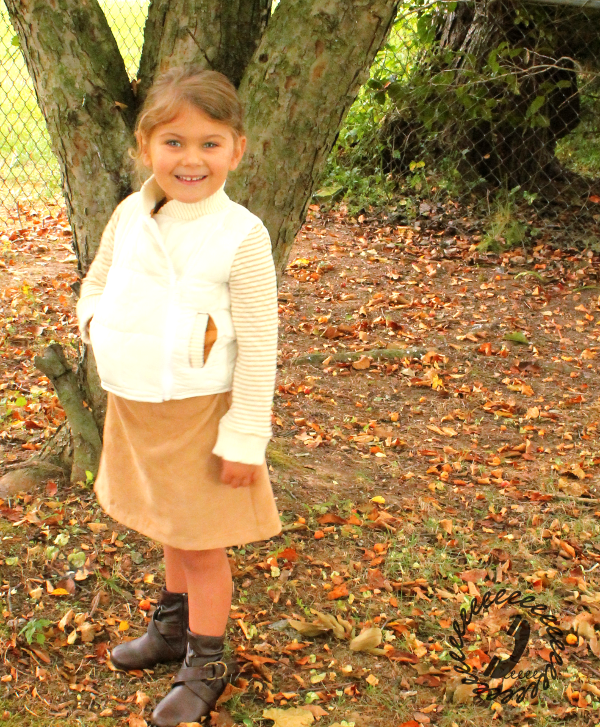 Check out the other bloggers on the tour (the pattern works for boys as well!) and don’t forget to stop by Jennuine Design and show her some love. There is a great giveaway so you won’t want to miss out!